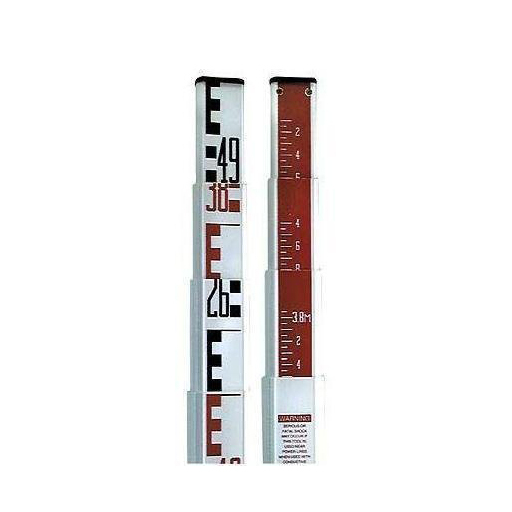 The CST/Berger 5 Meter Fiberglass Grade Rod is a well-built leveling rod that is the perfect solution for producing accurate level readings in construction or surveying tasks. It is made from non-conductive fiberglass that does not produce heat or electricity. For extra strength and to prevent damage, this measuring rod also has a scratch-resistant coating with special reinforced ribs. With clearly defined characters, this rod displays Centimeters/E-Metric graduations and a backside gauge that measures height at eye level. This leveling rod has 5 adjustable sections that are snug-fitting and capable of expanding up to 5 meters. This rod is equipped with long lasting universal spring loaded buttons to minimize sliding out of place and for extra firmness. A free carrying case is included for protection and simple transportability. A 90-day limited warranty is also included.